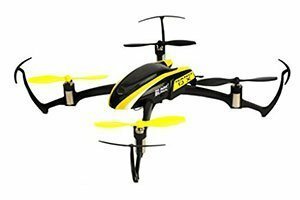 Top Drones Under $100 – Affordable Flying! 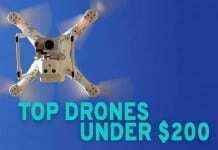 If you thought $200 was cheap for a drone, think again because there are now several options for drones under $100. Yes, the battle of cheap drones has begun and although drones names and functions may seem like a totally foreign, maybe even alien-like language and most, there’s no need to worry; we’re here to guide you. The drones on this list are perfect for beginners, and drone hobbyists too. Well, aside from the awesome controllers and amazing functions of the drones, this is the ideal toy for kids at heart. Keep reading and we are going to help you make the best possible purchase for your current budget. 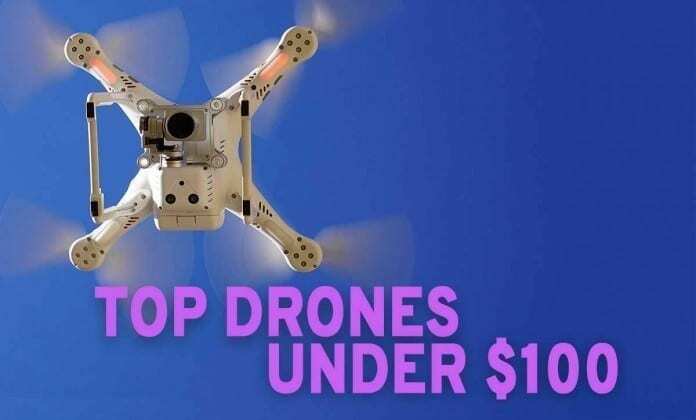 Since we’re listing down some of the top choices for drones under $100, expect them to be small. After all, these are regarded as practice drones and companies did a lot of cost cutting to lower their prices and deliver good quality products. Most of the drones on this list also come with prop guards. 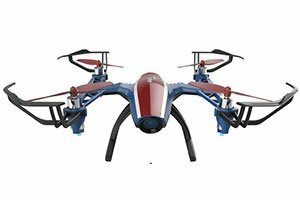 These products can endure a lot of pressure but most of the drones on this list come with spare parts in the package. The cameras that come with the drone unit are good but it’s not of professional quality. Also, don’t expect the flight time to reach more than 10 minutes. If you’d like to have drones that last longer or have better cameras, we suggest you to look at our list for drones under $200. The best thing about these cheap drones it can be the best training ground before you buy a more expensive one. There are four more major features you must consider which is the camera, flight time, and flight range. Don’t spend a fortune to fly drones. Don’t spend a fortune to fly really great drones. With so many drones on the market, you can easily find cheap drones that don’t sacrifice the pleasure and business of flying drones. 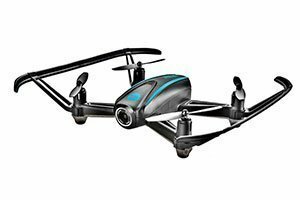 Here we review a list of drones under $100, that are created with sleek designs, quality cameras for aerial images, advanced features for tricks and safety, and ease of control. 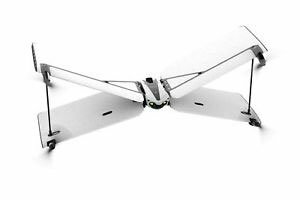 You may find the Altair Aerial AA108 priced at roughly $120. In most cases, though, it is below the $100-mark. Also, this drone comes with lots of amazing features – a benefit that is well enough for the budget price discussed here. Plus, the founders of this drone are heavily focused on customer service. If you give the support a call, they can answer all of your questions easily. 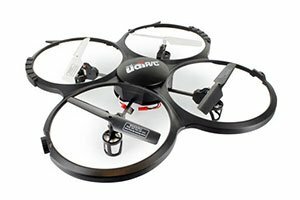 Among its feature are 8 minute flight, range of up to 300, 6-axis gyro, and 3 Flight Skill Level Switch (i.e. Beginner, Mid-Level, and Advanced). 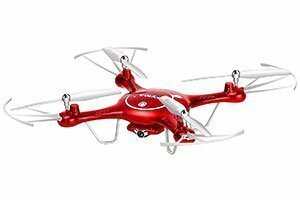 For a price that is very well on the budget, you cannot ask for more from this drone. The Blackhawk Drone is actually more advanced in terms of level quad, with between 15 and 17 minutes of Flight Time and a meter range of 300 to 500. 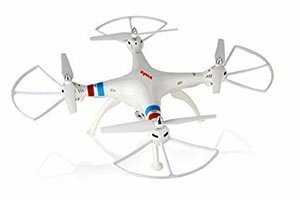 If your goal is to acquire an inexpensive drone that is a bit more advanced, then this is definitely for you. Not only does it come with a perfect GoPro camera, but it also extremely durable and stable. If you want something that is both fun to fly and fast, then you better buy this one right now. 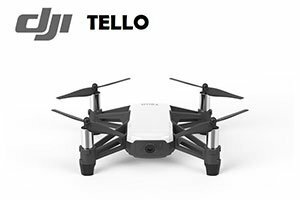 The Tello is basically a brand new quadcopter on the market and it hails from one of the biggest drone companies across the world. Mind you, it only retails for about $99! Technically, it is a joint venture between Rize and DJI. That does not really matter, though. The most important thing to note is that you will be introduced to a high-quality product for a very reasonable price. It comes with 8 dimensional flips, a 5 Megapixel camera, HD video, and a “Throw and Go” flight mode. 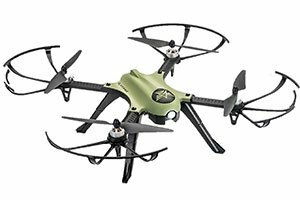 Although the list is focused on drones of under $100, we can’t help but include this one (currently priced at $150). For an addition of $50, you can rest assured that every single penny you spend is worth it. This one can be likened to the U28W (WiFI FPV drone) in terms of features and/or general specs, though this one is pretty much amped up. And while the price tag is quite higher, the price is totally worth it. You will even get 2 extra batteries, so you can maximize your flight time. Apart from that, it offers 10 minutes flight time, a Headless Mode, and a 720 HD camera, among others. The drone right here comes with HD Camera is a great bang for your buck. 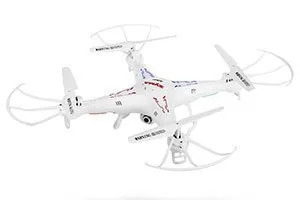 Despite being fairly minor drone, it is superbly cost-efficient – not to mention it is priced just under $100. It already comes with a handful of great aspects. For starters, the drone offers at least 2 batteries that each is capable of a charging power of up to 5 minutes. Just keep in mind that any repair or modification on this drone is almost impossible because of its size. The most interesting thing about this drone is its WiFi FPV, which is a true marvel for a UAV that is priced below $100. Do not worry if you do not get the Parrot Mambo Fly. That is because you can always go with the Parrot Swing, which is capable of holding its position steadily in the wind. Thanks to its peculiar X-wing shape, you are able to switch from the newbie-friendly drone mode to “plane” mode. The latter, in particular, enables the quadcopter to tilt forward and, thus, allowing it to fly more quickly. Also, the dual modes suggest that will not necessarily outgrow the quadcopter as you improve your skills. Of course, since we include the Parrot Swing, it is only right for the Parrot Mambo Fly to be part of the list. After all, it makes the overall flying experience fun, most especially to beginners like you. And just like its predecessor, it can also hold its position really well while in the air. The same thing can be said even if windy conditions persist. 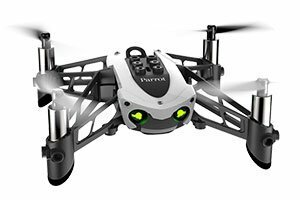 The Parrot Mambo Fly is all about giving you the much-needed freedom, so you can focus on flying as you get to learn about the different nuances involved in flying drones manually. Syma X5C1 is basically the upgraded version of the X5C (listed below). Apparently, it has become one Syma’s biggest successes. Even more so, it is highly celebrated for being a budget-friendly scene. Its four motors are designed to give him the right amount of power in order to transport small lightweight object. It comes with 2 pixel camera and is quite easy to mount. 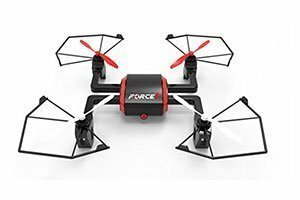 Apart from the said features, it comes with a flight time ranging from 5 to 6 minutes. This drone also be flown either indoors or outdoors. Either way, you are guaranteed of a memorable flight fly. Syma is a drone brand that has been here since time immemorial. In fact, its success can be traced back to its journey towards high credibility. And despite being known for servicing the low-end part of the market, a lot of enthusiasts are saying that the Syma X8C is an enjoyable one to buy. By essence, it can be called a heavy quadcopter with a weigh of 601g. In order to withstand the weight, the company decided to use a large 2S 2000 mAh in order to power its very own brushed motors. Through it, the drone can easily acquire 12-minute flight duration, not to mention the incredible flight distance of up to 200 meters. A drone that comes with reasonable price and stability is enough. If you are wondering about what an entry-level miniature UAV should look like, look no further than the Blade Nano. But hey, the design is not just its highest quality. As a matter of fact, it comes with the SAFE technology, which was patented by the company Blade. In case you did not know, SAFE stands for Sensor Assisted Flight Envelope. More importantly, it helps in gaining the right balance of stability and agility of the drone. But perhaps its biggest letdown is the fact that it is not an RTF model. Again, this is not entirely a bad thing. After all, we are here to discuss about the how satisfactory this miniature drone. Another drone hailing from Syma, this one right here is perhaps among the better looking drones. And hey, it is among the newest drones available on the market right now. It even comes with some of the most enticing feature, such as altitude hold and mobile app control, as well as a great FVP feature. It may not be among the most stable drones, but it can become fast the moment you get the hang of it. This one right here comes from Force 1 as the name of the drone suggests. And yes, it is absolutely one of the best budget drones out there. It even comes with a camera already. Considering the fact that it costs less than $90, it is a crime not to include it on the list. This quadcopter has a weight of less than a pound and can fit in your hands easily. As long as you are careful enough, you should not have troubles flying this drone indoors. And with its stabilization system, flying the Force1 UDI U818 HD+ Quadcopter outdoors will not be a problem.